Quantum computing is at the cusp of a computing revolution. A physical machine with 100 quantum bits is expected in the next 3-5 years, large enough to solve problems that classical machines can not solve. Our work focuses on the near- and long-term design of the algorithms, software and architectures of scalable quantum computing systems. Error correction on quantum bits in a trapped-ion architecture. Weilong Cui, Yongshan Ding, Deeksha Dangwal, Adam Holmes, Joseph McMahan, Ali Javadi-Abhari, Georgios Tzimpragos, Frederic T. Chong, and Timothy Sherwood. Charm: A Language for Closed-form High-level Architecture Modeling, In the proceedings of the 45th Annual Intl. Symposium on Computer Architecture (ISCA), June 2018. Los Angeles, California. Frederic T. Chong, Diana Franklin, and Margaret Martonosi. Programming Languages and Compiler Design for Realistic Quantum Hardware , Nature. September 2017. Ali Javadi-Abhari. Towards a Scalable Software Stack for Resource Estimation and Optimization in General-Purpose Quantum Computers , Doctoral Dissertation. Princeton University , May 2017. Princeton, NJ. Jeff Heckey, Ali Javadi-Abhari, Shruti Patil, Daniel Kudrow, Ken Brown, Diana Franklin, Frederic T. Chong, and Margaret Martonosi. 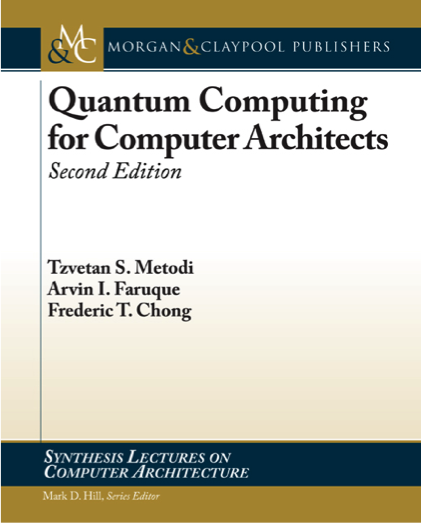 Compiler Management of Communication and Parallelism for Quantum Computation, Proceedings of the 20th International Conference on Architectural Support for Programming Languages and Operating Systems (ASPLOS), March 2015. Istanbul, Turkey. Daniel Kudrow, Kenneth Bier, Zhaoxia Deng, Diana Franklin, Yu Tomita, Kenneth Brown, and Frederic T. Chong. Quantum Rotations: A Case Study in Static and Dynamic Machine-Code Generation for Quantum Computers , In the proceedings of the 40th Annual Intl. Symposium on Computer Architecture (ISCA) , June 2013. Tel Aviv, Israel. Darshan D. Thaker, Tzvetan S. Metodi, Andrew Cross, Isaac L. Chuang and Frederic T. Chong. Quantum Memory Hierarchies: Efficient Designs to Match Available Parallelism in Quantum Computing, International Symposium on Computer Architecture (ISCA-33), Boston, MA, 2006. Dean Copsey, Mark Oskin, Frederic T. Chong, and Isaac Chuang. The Effect of Communication Costs in Solid-State Quantum Computing Architectures. Symposium on Parallel Algorithms and Architectures. San Diego, California. June 2003. Mark Oskin, Frederic T. Chong, Isaac Chuang, and John Kubiatowicz. Building Quantum Wires: The Long and the Short of it. International Symposium on Computer Architecture. San Diego, California. June 2003. Mark Oskin, Frederic T. Chong, and Isaac Chuang. A Practical Architecture for Reliable Quantum Computers. IEEE Computer, January 2002.